Releasing his 3rd full album ‘Monochrome’ since he last debut in Japan 5 years ago. Very different from his past album, expressive lyrics were used to portray himself in this album. Let’s get a closer insight into through this in this long interview and his self liner notes. J: Don’t you think it’s very different? J: Compared to the past 2 albums, the title and overall feel of the cover is very different. Naturally there are changes in the content, too. R: Yes, hence it will be good to start with the question about the reason for the change. J: Ok. Do you still remember the theme color of my first album ‘Just Crazy’? J: Yes, how about my 2nd album ‘Nature Boy’? R: Growth? 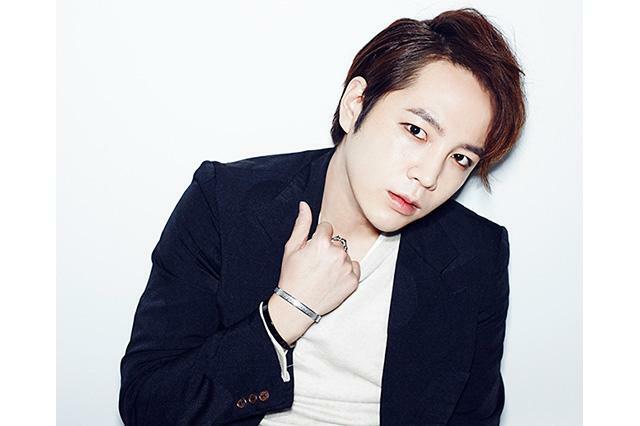 Portraying JKS’s own growing process? Is that the meaning? J: Yes, not sure if it is appropriate to say growth, but at least I think it describes well now. Because I wanted to take an up-front approach this time. I mean I wanted to portray the real me. Hence when I started producing the album, I set the main theme as something like ‘my own life’ and ‘one to one’. R: Calling it ‘Monochrome’ removes the need for any exaggerated décor, it’s liken revealing the truth to all. R: I see, so it captures your growth process. J: Perhaps I can also say that in my previous 2 albums it’s ‘Geun chan and everyone’s album’, but for this new album, it’s ‘Yours and mine album’. R: Indeed, compared to the previous 2 albums, this album has a close personal touch. J: It’s not Geun chan but Jang Keun Suk. ‘Monochrome’ is Jang Keun Suk’s album. R: I got a shock when I first listened to this album, as it was unlike your past albms. No glamorous tunes nor cheeky expressions. That’s why I felt worried about your mental health. J: Hahahaa, I admit the overall feel is indeed solemn and serious, yet putting it more accurately, it’s not exactly solemn, but a work of openness, which maybe adds to the seriousness. The main theme is not about seriousness, the honesty and openness is what I wanted to focus on, but I know it probably shocked many, and the title did cause some confusion when I first shared with the producer, too. R: Is the producer the same as the past, Mr. Choi Chul ho? J: Yes. He seemed to have an idea “Is Red the image of your next album?” But, I shocked him with my sudden change talking about ‘Life’ and ‘One to One’ that were never expected. However, he subsequently said “maybe it’s a right time to incorporate your personal growth in this album”. R: What triggered you to have such deep thoughts about your own life? Any ideas? R: Huh? You were still an undergraduate a year ago? J: Yes (laugh), and now I am going to post graduate school. I started to live on my own since last year. It may be partly the reason. And I suppose my age is also related in a sense. Based on the Korean calendar, I am 29 years old (27 based on Gregorian calendar). I am already approaching 30. There is a growing urge for myself to grow and mature. R: Didn’t you have worries that the audience would find this album too simple? What if many fans are still looking for the charmingly vibrant Jang Keun Suk? J: Yet, it is only when one is able to put a halt to the past, only then the true self can be revealed, isn’t it? R: Aren’t you afraid that the past image will be destroyed? J: Absolutely not. Till now, there is still much of me that has not been revealed to all, hence, there is this strong desire to show that to everyone. R: By the way, I found you had a determined attitude to sing fully in Japanese. I think it’s one uniqueness of ‘Monochrome’. R: Many of the chorus parts are also totally sang in Japanese. J: This time all lyrics were written by Japanese from scratch. R: How about your past tunes? The lyrics were written in Korean first and converted to Japanese? J: Almost half were produced in that manner. However, this time I asked to write all Japanese songs from the start. R: It’s alright. Go ahead. J: I wanted to sing a neatly packaged perspective rather than sing about my own story. J: Japanese lyrics are full of sentiments and emotions. Expressing such uniqueness of Japan, I wanted to touch the hearts of the listeners closer. That’s why I asked Japanese lyricist for help. R: So you thought not an outright account of your personal emotions, but portraying a perspective through the lyrics of the songs is better? R: Wouldn’t that contradict with what you earlier mentioned about “hoping the audience comprehends your true inner self”? J: How can I say… Maybe it is similar to when an actor is participating in a drama or TV program production, well, actually that’s not exactly the same either. To express myself is the utmost purpose, at the same time, settings by professional lyricist was also necessary for that. With their help, I believe I can convey my true inner self better. R: So we can say that the essence in each and every song conveys the feelings of Jang Keun Suk? J: Right, there were many communications with the lyricist on every song. To have the lyrics written, there were people who came to Korea all the way from Japan. For those who couldn’t manage to come because of the challenging schedule, the producer flew to Japan instead to convey my thoughts. Like this, we made the songs. R: Hence, we can also feel the unity from the whole album. J: Every song starts with my personal emotion. Speaking of expressing emotions, a special consideration has been made even in the singing style. For example, “Gu tto La kku – Good Luck”, I would have used the English pronunciation “Good Luck” to sing previously. However in this album, I chose to clearly sing out every syllabus “Gu tto La kku”, as I felt that will better connects with my Japanese fans. R: So we would hear “Ra Ji O – Radio” such pronunciation in ‘Road Race’ of ‘Monochrome’? J: Right! That has been unprecedented to date. Not using the English pronunciation “Radio”, but deliberately use the Japanese way of pronunciation to sing out. R: Allow me to ask next about your lead song ‘Hidamari’. I think it represents a ‘Yours and mine’ song. J: Just as the name suggests warmth, it conveys a lot of messages of hope. R: Pop melody, with a friendly singing tone. J: The lyrics in the chorus is “If you shed even a single tear, I just want to stay by you without a word”. R: Indeed, liken the sun shining softly in a cold day, the song brings warmth to our heart. J: I especially love this chorus. That’s why I was totally captivated by it since I first heard it. And the melody is also easy to remember, so I hope we can sing it together in live shows. R: I can imagine hearing it live, the blessed feeling would multiply. J: To tell the truth, the lead song was initially ‘Fragile like snow (awai yuki no yoh ni)’, not ‘Hidamari’. However, as soon as I completed the recording of ‘Hidamari’, all the staff said “I like this!”, “this should be the lead song”, and collectively agreed the change. R: ‘Fragile like snow’ is the first track, a winter love song in this album, less subtle compared to ‘Hidamari’. J: It’s rock, and inherited some style from my past 2 albums, which is why during the early stage of production, it was considered as a potential for the lead song. R: Both the lyrics and singing tone are lively. J: Typically sentimental and lonely songs would leave a deeper impression with the listeners of this album. However, ‘Fragile like snow’ is dynamic, portraying the image of a charismatic guy. I can say maybe there is a tendency for feeling Do-S character. tenshi_akuma’s note: Do-S is a Japanese way of describing one’s character. Do means extreme. S means sadistic. Like his past role in YAB, such a bossy character is sometimes called as Do-S in Japan. R: This (Do-S characteristic) is quiet similar to Jang Keun Suk’s style (laugh). By the way, it appears the love describes in this song is something like a forbidden love. J: Hmm… a forbidden love. In a sense, you may feel so, listening to it. R: ‘Before Dawn’, ‘Road Race’ and ‘To the place where the sun shines’. I think these 3 songs give this album snap. J: They are up-tempo tunes. R: Compared to previous albums, the balance in up-tempo and soft tunes are reversal. I suppose singing ‘Before Dawn’ is hard for you? J: Very tough (laugh). Compared to a typical short tune, there are more words in one song, which made it more difficult. In contrast, the recording of another quick tempo song ‘Road Race’ was completed in a blink. I could sing naturally as my heart flows with the strong beat of the song. R: Placed as the last song in the album ‘Let’s go back sweet home’, the leisurely acoustic music brings about a carefree atmosphere. Very touching. J: It’s a confession song from me to myself. I think this song has such an aspect. I previously never have time to reflect on myself, however, since last year, I’ve finally had time to stop and asked myself “Why am I running till here?” . This song reflects such a feeling. R: The last verse “Seeing tomorrow, it’s time to move forward” sure leaves a deep impression. J: Right. Returning home means not the final stop. J: There is a feeling that it’s a temporary break. Even though taking a break, it is also a time for growth. So there is a possibility that I’ll become hyper again. If it happens, it could bring about a new perspective. ‘Monochrome’ is an album that means a lot to me, even till death. I think only this track leaves a similar impression to the past 2 albums. Hence initially it was intended as the lead song. Don’t you think it gives an upbeat feel of a charismatic guy? In contrast, a sad song. It is rather unthinkable for me to sing such a lonely song, but it set a new challenge for me in a sense. This is a broken-hearted song which speaks of the stories from the past till now. A fast beat, up-tempo song, which uses many lyrics, hence was the toughest to record. There is a line in the lyrics “Even if the answer is unclear, look at your yesterday self and look forward” which speaks of the various hurdle one has to cross. The lead song of this album. As soon as the recording was completed, the staff and I collectively said “this is the one!”. A song that resonates, with a chorus full of hope! I have not confirmed, if possible, I hope to sing while playing the guitar during the live show. Only included in the normal edition, a mid-tempo song. This is also a song of hope, however, unlike the past zikzin ahead style, this is slightly more controlled, touching directly the inner hearts of those listening to the song. A fast beat song, in fact the fastest song in this album. With the strong tempo, singing out naturally with the beat of the heart. It feels like singing on a moving train. Not a lonely song. I really like “tu tu tu ttu~” accompanying parts. There is a movie “Begin Again”. I felt this song has the same atmosphere as that movie. Full of emotions. Hence it requires a lot of energy to sing. In fact, after recording the song, I was so tired and fell down on the car on the way home. It seems one sings the song on the stage alone. It would be more appropriate to say that the lyrics sounds like a conversation. When I first read the Japanese lyrics, I thought so. Even after singing the song, I felt the same. I felt like I was speaking to friends in junior or high school days. It’s my favorite song in this album. Placed as the last song in the album, a warm and reminiscing song. “There was no fear at all. I lived a life of my own feverishly”. Maybe these phrase are quite symbolic of my life thus far, the present-day me, presenting my true self through this song. dear teanshi, thanks for sharing!!! Now I have two ways of expressing sukkie answer ^^. both answers are correct to me, because I do not speak Korean nor Japanese :(. therefore I could not discuss none of the translations ^^. therefore Both are very good for me. Dear Tenshi, thanks you very much!. I appreciate the work of all eels, eels always want to share a good job. Therefore I do not think among eels try to mislead, because I know that everyone eels tries to do the best, a good job. bcos all eels really love prince sukkie. I checked both translations made,and personally, both are very similar almost identical, the only difference is the use of words. and obviously that part where our sukkie gives an answer (*). that would be the only different part, the rest is equally as well. With respect to the songs, I am very aware that this was written by Japanese lyricists professionals, bcos they know Japanese terminology with which can to express and transmit better all sukkie’s emotions. I know all are doing from good intentions, but the part should have been very carefully translated. Like you, some might have misunderstood he was talking about his love relationship in university days… I think most parts are ok if there includes some differences. So I always try to be careful reading many sources. Dear Teanshi, in my humble opinion. 1st FACT. JKS said that This album ‘monochrome’ describes A MAN who FALLS IN LOVE with fear in his heart and also who pursues his dreams. therefore the songs are about his LOVE, his dreams, his pains, his farewell, time, his fears, his HOPE and more. Sukkie obviously wants to share with us his deepest feelings even his feelings hurt by love and if we are going through a similar situation, then sukkie wants to give us that hope which he has, now. > in Hazy translation: Sukkie confirmed that the essence of each song conveys the feelings of JKS. Sukkie replied “right, …”. > in the other translation: JKS confirmed that the essence of each song represents Jang keun suk’s heart. Sukkie replied: “of course, …”. In both translations there is the affirmation that the Lyrics have the essence of HIS feelings or HIS heart. so the lyrics are reflecting his deep life and feelings with more poetic form and made by Japanese lyricists with Japanese terminology. 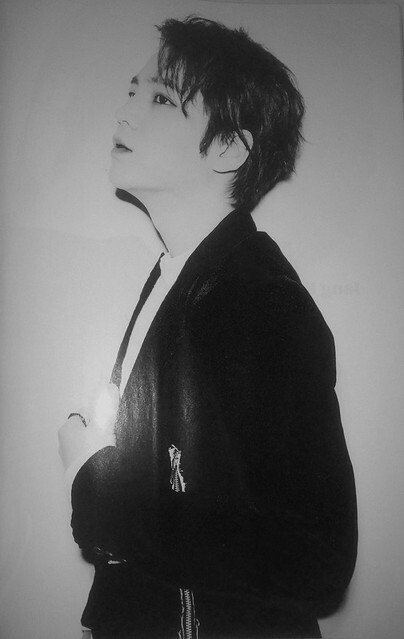 I love all eels’s work, I would like to help them but I do not speak Korean nor Japanese. :(.sorry. I love his interviews 🙂 🙂 , and always remember when an ajuhmma eel told me, “we must not forget that our sukkie is very smart when must use his words to express his deep feelings. Sukkie has a way of expressing very smartly every word”. sometime other eels even lights me up with your words and tell me, must observe more carefully his smart words and find a clearer answer because that will not be visible by everyone. Hi Fabiland7! You are of course entitled to have your opinion. I just want to say that Tenshi has translated for years, and know what she is doing. I have read the same translation as you. It´s translation from the TEF-team, right? I have read that part several times because I was surprised that the interviewer didn´t ask more about that relationship. If Suk suddenly had sad that he had had a girlfriend 1-2 years ago, he would get a lot of questions about it. I can understand why they have translated it wrongly when I read the sentences. I´m traying to learn korean, and it´s hard. Japanese and korean language have totaly different sentence structure from english, and many other languages. sorry if I did not answer before, I was busy, but I’m here again. something curious is that I even found a same interview/song of famous celebrities kpop/jpop translated in 3 to 5 different ways. all with different words but with the same message. 🙂 ^^ therefore I chose all as good. THANK YOU SISTER TENSHI FOR THE TRANSLATION. Wow!!! Sissies thanks a lot. thank you very much for translate this article . I would say that Monochrome is elegant. Love how he describes it as Jang Keun Suk´s album, not Geun chan´s album. Glad we can read his notes on every song. This process of understanding Monochrome is very exciting to me who don´t understand japanese. I´m happy every time I find out something new. Thank you so much for the translation. “Let’s go back sweet home” and “Before Dawn” have been among my favorites since I have heard the preview. Hope you will translate them too. Since I’m going through an emotional “growth” stage, myself; this interview had me in tears. Like good tears, that I felt that someone else in this world is having the same questions about life, one’s on existence, etc. It’s a very emotional and hard place to be. But, after reading this interview and the translation (thank you tenshi), I don’t feel so alone. Just feel like this is an absolutely normal place to be, and will enjoy this album when I get it even more because of my own current self-reflection. thanks tenshi again for translation. I hope I can see the interview in video version like he did for nature boy album.kkk..always not enough. im happy they choose hidamari as the title song. act..I like the first track genre but that song is not polished enough to be the one. I found its heard to digest the change of the parts..it sound like many song in one song.kkk..and I dont really like the chorus too. love the second track even frm preview. still maintain the rock feel. 5th song sounds like cnblue song. i dont know much about kpop actually..but have heard some which i like frm cnblue and beast. 6th love it..sounds like a love song too..or broken hearted? 9th sounds like a positive song. full of hope and dreams. his fav in this album..
10th my fav in this album..sounds a bit country..love to hear this song live with acoustic. Thanks Hazy and Tenshi. Eels able to get a great grasp of understanding the meaning of each song through your translated article. This really makes us feel the relationship and bonding of this album between suk and eels. Thank you for all the translations. without these, we will be at a loss. your work is highly appreciated. Thanks so much Kaori & Hazy for your sincere effort to translate Sukkie’s words & also try to decipher the meanings of his cryptic words. His wisdom and usage of words are beyond his age. That’s why we are always hooked cos we find him such an enigma. Dear tenshi,Thank you so much for this interview translation. I enjoy reading this report. Thank you guys for the translation, thank you! Thanks a lot Tenshi for the translation! I always love Sukkie’s interview. He always gave profound and witty. A million thanks to you Ms. Tenshi and Ms. Hazy for doing this, we really appreciate your effort. Thanks so much for this translation, dear Tenshi and Hazy. I was impressed from the first reading, then I tried to translate as accurately from English, in my native language, so that I feel closer to him. Honestly, there was no need but this interview showed me a true artist, attentive to details because that his endeavor to reach the hearts of those who follow him. An artist with respect to his work, to support team work and especially to viewers and listeners. tenshi thanks for the translation!! Thank u sooo much for translating the whole interview to English. You make us feel more closer to Oppa :). The monochrome character, we ll always stick by you Oppa.